This year has seen me partaking in a lot of test knitting. Some of it has been 'in house' testing of club patterns, some for friends, some just when I see something I like on a testing board on Ravelry. Earlier this year I replied to a call out for testers from Belinda Too aka Blendy Knits. Belinda is a NZ designer who published a pattern book - Blendy Knits Socks - last year. She had a new book in the works and needed testers who could use NZ yarns to test the patterns. So I replied, got allocated a pattern, knit it up , sent it off to her and then...kind of forgot about it! Blendy Knits Again is Belinda's follow on pattern book with a range of patterns; from scarves, hats and mittens to legwarmers and socks. I love the layout of the book, with it's clear difficulty ratings and coloured sections for each 'type' of pattern. There are some really fun patterns ( a child's hat that looks like a Wot-Wot, zany legwarmers) and some lovely elegant scarves. The pattern I tested was this baby cardigan. That's my knitting the cute baby is wearing!! I love how it looks on a real baby. It was a fun, if somewhat challenging knit, made in some gorgeous Vintage Purls sock yarn. There is something pretty special about seeing your own knitting (and your name) in actual print! I've been given the cardy back now and will keep it my baby gift box. Blendy Knits Again is available here. Frank is a very cute and quick knit from Katie Boyette's Knit Wit book. You might know her as caffaknitted .I have long admired her quirky toy patterns and this is my third knit from the book, having made an Owl and a Robot earlier in the year. Frank is destined to be a Christmas present, but he's so cute I may have to make one just to keep! This is a great pattern for leftovers. I didn't weigh my yarn but it probably took less than 20g. The pattern is written for worsted but mine is DK and I didn't make any adjustments other than needle size. And did I mention quick? A few hours. Now I just need to find an equally quick and cute knit for the recipient's big sister! It feels funny typing that when really it is summer that is coming but if you have read or watched "Game of Thrones" (George R.R. Martin) then you will recognise the quote. Game of Thrones has just started airing on the new Sky channel SOHO and I am loving it so far. I am probably only a couple of nights reading from finishing the the book as well! If you love epic medieval fantasy novels then I highly recommend it - it has everything from action, suspense, political intrigue to the spooky supernatural. This month Tri'Coterie is offering a range of "winter" yarns with a bent towards Game of Thrones - think greys and black, sparkly snow and a wintery palette. For stripes this month, Maylin chose the banner colors of the Stark family - wardens of the cold and icy north - in greys and white. I had an advance sample of this as a BFL wool sock yarn and decided to knit it up into something 'not socks' to see what happened to the stripes in a FO that wasn't a sock. I know, it looks a little strange but this is a new pattern called "vertebrae" by a friend of mine, Kelly Brooker of knit-so-quaint, and it was designed to be frontless. Ideal for spilly babes or for use when baby wearing - when the baby has their front to yours but you want some coverage for their back and arms. The lack of front pieces makes this a fast knit,even on 4ply, and I love how the stripes turned out. Very very cute. This is the 3-6mth size and used about 75g of yarn. At the moment a free version is available on Ravelry (newborn in 4ply) and the extended version for babies (for which I was helping test) will be up soon. She is also working on a kiddie version as well and hopefully in the future an adult sized pattern. I think it would make a lovely summer cardy for when you want to keep a breeze off but it's too warm for too much fabric. This month we are also trialling having a pattern offered alongside the yarn which is an exciting new avenue for us. 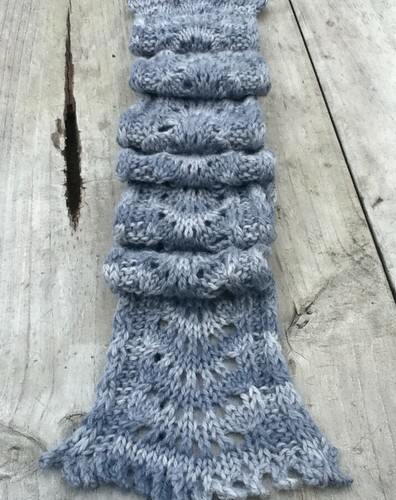 This is my new pattern "wolfsbane" and is knit in gorgeously soft baby alpaca (chunky/14ply). The semi-solid grey colourway is aptly named "direwolf". I love how the grey tones give it a really wolfish look. The pattern is an easy lace panel flanked with cable twists. There is a provisional cast on in the middle of the scarf which is probably the hardest part if this is a new technique to you, but otherwise it is a lovely fast knit, perfect for when winter really is coming. We are offering a special on the yarn - 10% discount if you have purchased the pattern. This is available until Dec 15 (or until stocks last). Wolfsbane is available for purchase for $3US. You can see all of the November winter yarns at the Tri'Coterie group on Ravelry. And now I'm off to read some more Game of Thrones!